How Long Does Adderall Withdrawal Take? Adderall is the brand name of a prescription stimulantdesigned to treat attention deficit hyperactivity disorder(ADHD) in children and adults. Although the US Food and Drug Administration (FDA) approved Adderall in 1960, this medication experienced a surge in popularity in the US in the 1990s as more children received diagnoses of ADHD. The medical understanding of ADHD and how it should be treated has improved a lot in several decades, which means that the combination of prescription drugs and therapy is widely used to manage this behavioral disorder. Unfortunately, with more children receiving this combination of amphetamine and dextroamphetamine to treat their condition, Adderall is widely available and often diverted for abuse. Some research shows that Adderall prescriptions surged 45 percent between 2002 and 2010. While Adderall is extremely effective at treating ADHD and used off-label to treat somnolence problems associated with sleep disorders like narcolepsy, the availability of the substance also means it may be given away, sold, or stolen for nonmedical reasons. In people with ADHD, the surge in dopamine triggered by amphetamine and dextroamphetamine helps to improve focus and attention to tasks and to reduce physical jitteriness or shaking associated with too much energy in the body. However, in people who do not have ADHD, the stimulation of dopamine triggers intense physical and mental energy, greatly elevated mood, sleeplessness or restlessness, and jitteriness. Because Adderall has been widely prescribed to children, the drug is abused by many high school and college students as a “study drug.” Students without ADHD see the mental and physical improvements in their ADHD-diagnosed peers and believe that the drug is solely responsible for the enhanced performance. These students are likely to ask their friends for pills, especially when exams, tests, or major papers are due because they believe that the stimulant drug can help them stay up all night to complete assignments, retain more information, or cram for tests. 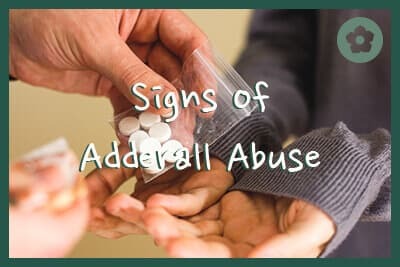 As the first generation of study drug abusers grew up, they continued to abuse Adderall to increase their physical energy during workouts, reduce their appetites so they could lose weight, and stay focused at competitive, intense jobs with long hours. Adderall is extremely addictive for people who do not have a medical reason to take the drug. Abusing stimulants can cause harmful side effects – not just addiction, but acute and chronic physical harm that can reduce quality of life or lead to overdose and death. Even taking Adderall as prescribed can cause side effects; however, problematic and dangerous side effects are more likely in people who abuse this drug for recreational reasons because they likely take larger doses more often than a medical professional would recommend. These may be signs of an overdose. If someone displays these symptoms, call 911 immediately. They need emergency medical attention to survive. Other signs of the Adderall crash include intense cravings for the drug, anxiety, irritability, panic attacks, fatigue, low mood, unhappiness, physical discomfort, and even suicidal ideation. People who take Adderall as prescribed avoid this crash, in part, by taking the amount their doctor recommends; they also receive medical supervision to taper off the drug if they want to quit Adderall. 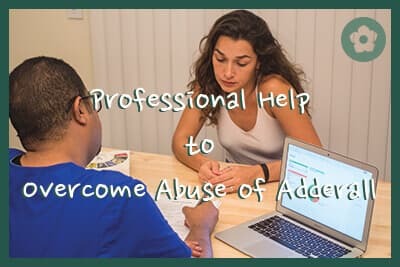 Without medical supervision, misuse and abuse are much more likely, and the withdrawal symptoms from suddenly stopping this drug can be intense. Many people relapse into Adderall abuse because of the discomfort of withdrawal, but this can cause an overdose. Adderall addiction can be effectively managed, but it requires attention from medical professionals who understand addiction to stimulants. Getting supervision to ease the physical discomfort of withdrawal is the first step; after detox has been successfully completed, a comprehensive rehabilitation program can help one to recognize the underlying causes of addiction and personal triggers. Fortunately, there is a lot of help available from addiction specialists to stop abusing Adderall.